Your inner goddess will undoubtedly say “Yeah, right” when she hears all the supposed benefits of using a Vortix Eye Massager. 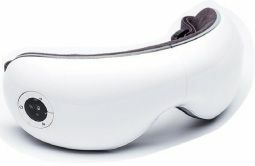 The battery-operated plastic mask aims foremost to soothe the fine muscles and nerves of the eyes and temples using vibration, air massage, and heat. Fine: Every goddess with a desk job or smartphone has once said, “Mine eyes, they are strained and sore.” Vortix promises more than relief, though, claiming that eye massage tames stress, insomnia, migraines, and dark circles. Oh, and one more thing: Because it stimulates neglected nerves, it can, ostensibly, restore a user’s vision.